HOMESTEAD, Fla.— As a child, my dislike of nature was apparent— so apparent that my mother sent me to summer camp at a local park where I learned about leaves and bugs and dirt. Every Friday, our camp counselors would bring out the kayaks and canoes to give us lessons, pairing us up with another child in our age group and sending us off into the murky barracuda-filled waters. The only things I learned at this camp were that poison ivy is poisonous and that kayaking is a really tough arm workout, especially if your rowing partner is feeling particularly irritable and uncooperative. 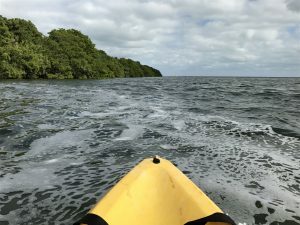 Click to view the video by writer Brittany Chandani about kayaking in Biscayne National Park. My summers at nature camp did no good since, to this day, I consider sitting outside a restaurant as being in nature. To conquer my fear of spiders and other living things, I decided to go kayaking again, but this time I would get to choose my kayaking partner and go where I wanted. Naturally, I chose Biscayne National Park—a beautiful park that is 95 percent water—and my boyfriend as a rowing partner because his upper body strength would make up for my lack of it. As we pulled up to the Dante Fascell Visitor Center at Convoy Point, the kayak rental station was already visible on the bed of tiny rocks where the parking lot turned into the water’s opening. We parked in the large lot and made our way to the kayaks where Brian assisted us with the rental. His shaggy lifeguard hair and sporty sunglasses made him seem like a real expert in nature. “There are whitecaps today and the wind is a bit rough, but we’ve been renting and everyone seems to be fine,” Brian said. Kayaking in open waters at Biscayne National Park (Photo by Brittany Chandani). He gave us life vests and brought the kayak right up to the shore. I sat in front, being the smaller person, and my boyfriend sat in back. Brian slid the kayak into the water and waved us off as we floated into the sea. Thirty seconds into our adventure, my backside and legs were drenched from the water splashing into our kayak. I was very annoyed. The choppy waves and cold winds made for a difficult start, as we seemingly went nowhere, but we were as fatigued as if we completed our adventure. “Honey, what are you doing?” I irritatingly questioned my kayak partner. “I’m literally getting splashed so much. Can you not?” I snapped. My anxiety levels were high, being off of land and in nature. I do not think he was paddling in time with me and he was turning us directly towards the waves making the kayak bounce up and down off each wave and splashing me. I suggested that we follow the sides of the mangroves where the water looked calmer. He concurred. We paddled slowly as we concentrated on looking for wildlife. He spotted what he called a cormorant bobbing up and down trying to catch a fish. Next to that, we saw two men fishing in small yellow boats. One got lucky— we saw him reeling in a fighter! We paddled into deeper waters until we were far from land. My boyfriend wanted to go around the islands, which I thought would be very difficult due to high windspeed, but Brian said we might see stingrays behind the islands. As we paddled towards the two islands, the winds became very strong and I became very annoyed. Clearly, this was not my idea since I learned that low pressure means high speed winds in my physics class, but my boyfriend did not know this. It was exceedingly difficult to paddle and my grumpiness was evident. If it took a second longer to get through, I think I would have pushed him out of the kayak—but I kept it together. We made our way back around—not a stingray in sight—and let the waves carry us closer to shore. 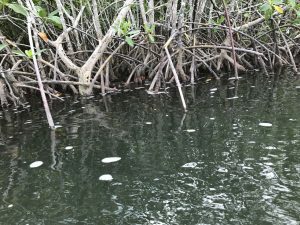 Then, we turned back by the mangroves and into a narrow crick. We saw small seagulls hopping on branches at the opening of the crick. Further in, we saw one brown and one white ibis hanging out in mangrove branches. They looked like they were friends. As we paddled deeper, the water became very calm so we took a break and let the water and wind carry us straight through. 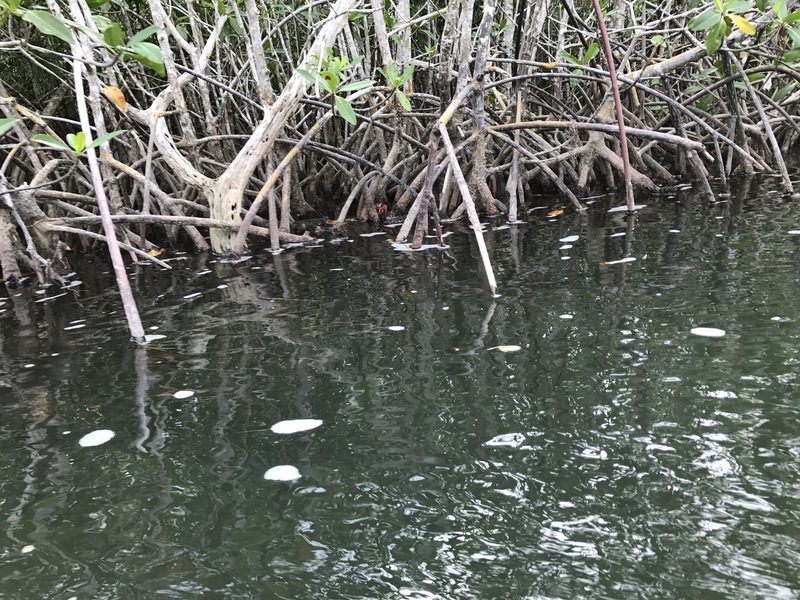 We spotted bright red hermit crabs with bulging little eyes hiding behind mangrove branches along the sides of the crick. As we traversed the quickly narrowing crick, we decided it was time to turn around to avoid crashing into things. But before we did, a huge coffee-colored pelican flew up from a hiding spot ahead of us. I wish I caught that on camera! It was literally bigger than me. All of a sudden, a low hanging mangrove branch that served as a spider community came into our path. Foamy waters on a windy day (Photo by Brittany Chandani). “Oh my god, we are so close to that spider— TURN, TURN, TURN,” I exclaimed. “We are so far away—you need to calm down,” he replied. “Alright, we’re turning around. Let’s go back,” he said. I think he was starting to get annoyed, too. We made our way back the shore where Brian was ready to pull our kayak in. My fatigued arms were grateful that it was over. The powerful winds, blue skies, and radiant sun gave us energy. 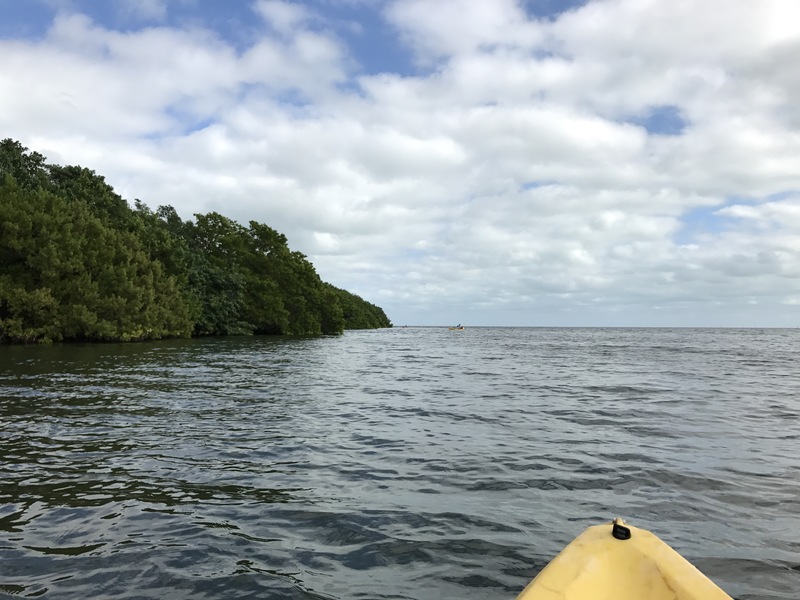 Our kayaking went much smoother than I thought, especially after seeing a couple of kayakers get caught in the mangroves. A hermit crab hides in the mangroves (Photo by Brittany Chandani). All in all, it was a scenic workout that allowed me to get closer to nature—without getting too close to any insects. I discovered many birds that I would never recognize if not for this trip and I realized that not all crustaceans are scary, but I wish I could have seen a manatee. Maybe next time. Wear a hat, flip flops and water-friendly clothing. Bring plenty of sunscreen and water. The Dante Fascell Visitor Center at Convoy Point in Biscayne National Park is located at 9700 SW 328 St., Sir Lancelot Jones Way, Homestead, Fla. 33033. For more information, visit https://www.nps.gov/bisc/index.htm or call 305-230-1144. Parking is available in a lot west of the visitor center. The kayak launch point is to the north side of the visitor center, near the parking lot.